Take A bowl. Put Green gram in the bowl. Add water till it fills. Close it and leave it for 8 to 10 hours. Then drain all the water. After draining shift the soaked green gram in a hot box and close the lid. Leave it for two days minimum. Then you will find that the mulai had came out. Then if you wish you can keep it in fridge or else you can start preparing the sundal immediately. Keep the kadai and add oil, mustard seed, ulad dhal, red chilli, dry curry leaves - one by one. 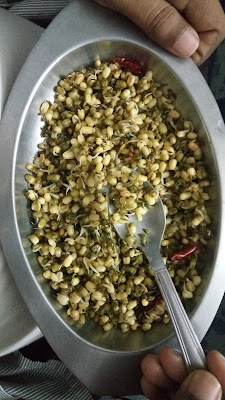 Then put the sprout green gram in the kadai and sprinkle some water. Mix it and wait till it boils. Then add salt and mix it well. If you wish you can add some grated coconut, mix for a few seconds, and switch off the stove. Serve hot. If you wish u can add lemon drops also instead of grated coconut, but you have to add the lemon after the sundal gets cool.